Each day there is a new swing of the pendulum of life. 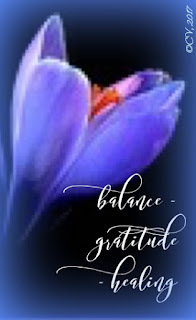 It is a full-time endeavor to live each day in a balanced, mindful state. There are always ups and downs that can throw me off balance: arthritis aches, household concerns, paperwork, and different moods of family members. At times, I have literally and figuratively felt that I have lost my footing. When I do, I need to slow down and reflect on how to restore a sense of calm and equilibrium. One weekly practice that I find helpful is yoga. It provides me with a mindset of care and has helped me recognize off-balance times when adjustments in one's lifestyle are needed to restore peace. 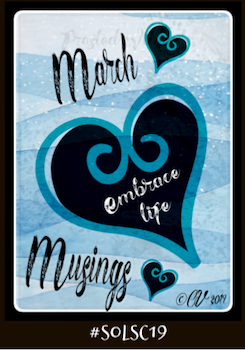 Tweaking an attitude, a stance, or approach are helpful points to remember as I go about my daily living routine. Today, during the Ash Wednesday service, the diocesan bishop spoke about a call to action: "It is important to keep our balance." Finding balance is a road to a peaceful spirit. Poetry is the rhythm of the soul. If interested in reading the poetic version of Ecclesiastes 3:1-8 click here. Poetry is the rhythm of the soul. If interested in reading the poetic version of Ecclesiastes 3:1-8 go to poet.org. 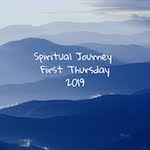 Doraine Bennett is the host for Spiritual Journey first Thursday. As a yoga instructor and poet, Doraine strives for balance within and outside of her yoga studio. 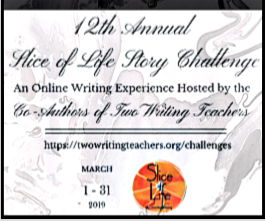 I will be offering this post to the Spiritual Journey first Thursday writing community at Doraine's blog and also to Two Writing Teachers for the March Slice of Life Story Challenge, Day 6. I love your black and white photo with your haiku. Balancing is a life skill. The consequences of not doing it can be unpleasant. Thanks for the reminder. Thanks for your comment, Alice. I am working hard at trying to balance my life. It's hard work for sure. So impressed that you are ahead of the game, something must be balanced for you, Carol! I like those synchronized steps. Time for me to figure out how to approach balance. Ahead-ha ha. I am trying to stay on top of the water without drowning these days so reflecting on balance is key to me right now. I am at a state ed conference for 3 days and trying to also get in my thinking and writing time, Ramona. Balance and mindfulness are vital during busy times. Looking back, I do not understand how I functioned without daily mindfulness practice in the past. I hope that the 3-day conference will give energy more than take it. 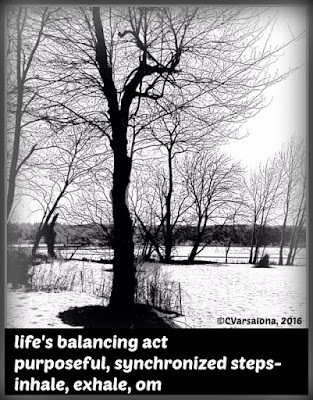 Perhaps it is meant to be this way...that we must focus on the balance in our lives more as we age? Physical, emotional, spiritual balances seem to be more acute now. Perhaps it is like being a child. When you fall you have a very short distance to go, your bones are not set as hard, you practically literally bounce back up. So balance is not as crucial. You have a longer time to recover, too, if indeed you did any longterm damage. Just an interesting "think" as I began to comment... I really love and need to read all these posts on Balance today! I just finished a long day of learning and working with colleagues at the state ed conference. While there, my mind was on a PD I have to do next week that was not clearly defined to me. Now, I am back at the hotel with some down time. Being part of our community and reading the balance posts is what I need. My husband was just commenting about the aging process and how long it is taking him to recover from a fall he took the other day. I think we've shared before about our experiences with yoga. I am trying hard to get into a routine, but I keep running into road blocks. But having a yoga practice helps me balance as does a meditation practice. I will not give up. Margaret, I have recognized that my wants cannot be satisfied when there are immediate needs. Now that I am at the state conference I am missing my yoga class. There is a time for every matter and I am slowly recognizing the significance of that phrase. Best to you and Little Leo. Life is always throwing things at us that make us feel like we're losing our footing. I was feeling off-kilter this week. I was sleeping terribly with my mind in multiple places. That's when I realized I hadn't meditated in several days. So what did I do? I meditated! This morning was my second day in a row. It was just what I needed to feel a bit more sure-footed. 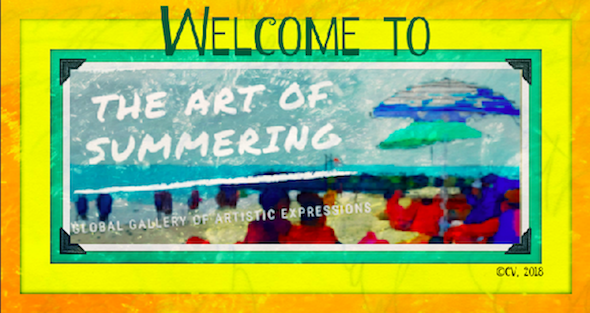 Stacey, thank you for stopping by to read and comment. Once we routinely meditate to reconnect with ourselves we gain a sense of connectedness. It is our anchor in a world of flux. I like the way you connected balance with Lent. Balance is so, so important! I lost some balance last year when I first started my new job. It seemed to consume me, and I couldn't find that balance. I'm doing much better this year with it, and I am so much happier! I love that Ecclesiastes passage! I had a group of teachers put it in a TIME unit around Tuck Everlasting! On another note, it makes my heart happy that Spiritual Thursday is still going strong!